HyperX has quickly become known as a manufacturer of quality gaming headsets ever since it released the first Cloud headset way back in 2014. The company has since expanded its gaming headset line to include not only improved versions and variants of the original Cloud design but also new designs that fit the needs and budgets of different users, from the high-end Cloud Alpha to the more affordable Cloud Stinger. Now, the company has expanded their lineup once again with the release of the Cloud Earbuds, the company’s first pair of gaming earphones. With the growing popularity of the Nintendo Switch and mobile games on smartphones, it wasn’t such a big surprise that HyperX would eventually release a pair of earphones. And with a price tag of only PHP 2,999 (~USD 50), the HyperX is sitting at a rather good spot against its competitors. The Cloud Earbuds mostly come in HyperX’s signature red and black color theme. 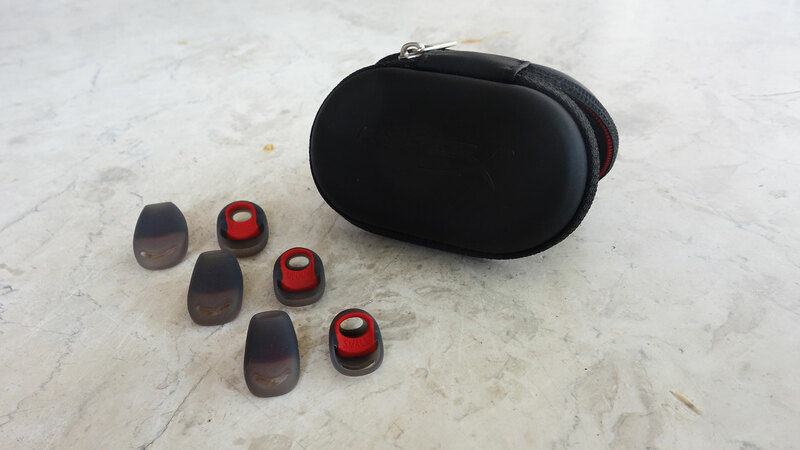 The plug, cable, and outer earpiece case of the earpiece come in red while the inner earpiece, in-line control module, and back of the earpiece case come in black. The color scheme really makes the Cloud Earbuds stand out and actually matches well with the Nintendo Switch but may turn off those who are looking for a more discreet pair of earphones. The earpieces of the Cloud Earbuds feature a rather interesting design that’s sort of a hybrid between an earbud and an IEM (inner-ear monitor). Instead of your typical dome earbud design, the Cloud Earbuds feature a nozzle similar to what you’d see on IEMs. 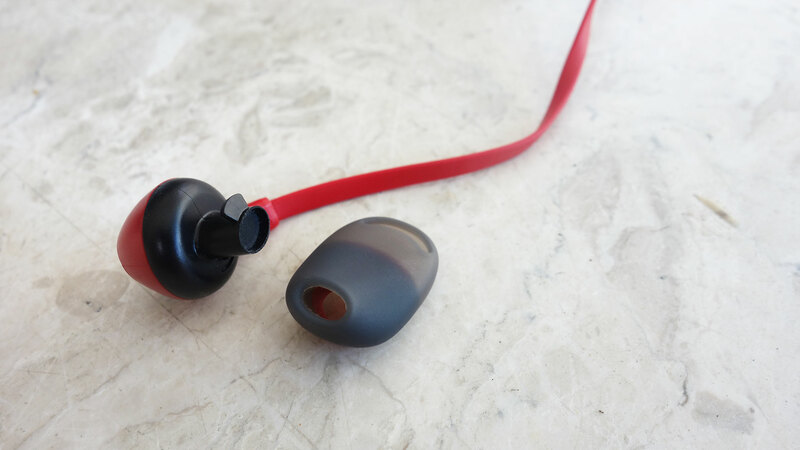 But rather than your typical dome or cone-shaped silicone or foam tips, the tips that come with the Cloud Earbuds are shaped rather uniquely and are secured to the nozzle via a flat plastic tab. Unlike your typical IEM tips, the ones on the Cloud Earbuds don’t actually go into the user’s ear canals and instead end right at the canal’s opening. While they’re still able to funnel sound into the user’s ears, they don’t provide the same isolation and secure fit as typical IEM tips. To keep the earpieces secure in the user’s ear, the silicon tips feature a wing that holds the earbuds in the concha of the user’s ear. The Cloud Earbuds come with three tips to fit ears of different sizes, and the unique design of the tips are rather comfortable and don’t cause fatigue even after their worn for a long time. The wing of the tips are quite effective at keeping the earpieces secure to the user’s ear while also helping with isolation despite only sitting at the opening of the ear canal. It must be noted though that the tips easily detach they’re pulled a certain direction so we wouldn’t recommend letting them just hang on your neck unsecured while you’re walking. Apart from the silicone tips, the Cloud Earbuds also come with a hard carrying case where users can store the extra tips as well as the earphones themselves when not in use. This helps make sure the silicone tips don’t accidentally fall off during transport, as previously mentioned, and also protect the cables and the earpieces themselves from getting damaged. It’s a nice addiiton that adds some extra value to the Cloud Earbuds package. HyperX has made the cables of the Cloud Earbuds flat to make them less prone to tangling and has included a slider to keep most of the cables together during storage. The cable measures about 1.2 meters so while it’s long enough to use with smartphones, laptops, or portable consoles like the Nintendo Switch, it’s too short to use when plugged at the back of a computer or the front panel depending on where the rig is positioned. 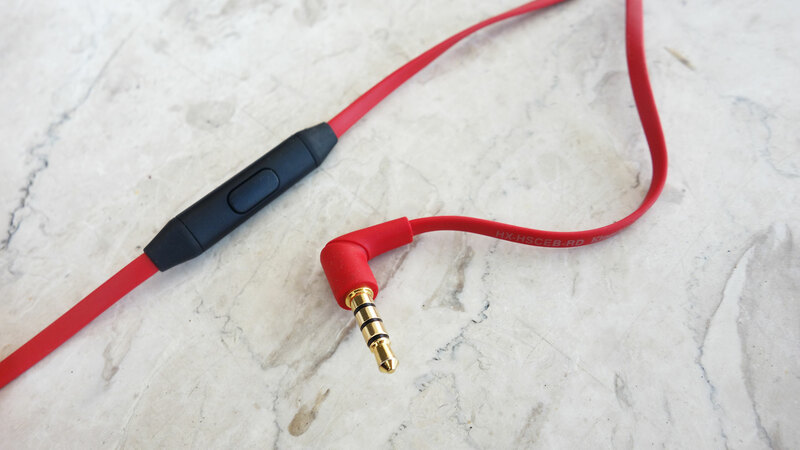 The cable of the Cloud Earbuds terminates at a right-angled connector with a 4-pole 3.5mm gold-plated plug. This makes it compatible with the Nintendo Switch, most smartphones with 3.5mm ports, and even the PS4 and new Xbox One controllers. For use with desktop PCs and some laptops, you’ll need to get a 3.5mm splitter to be able to use both the audio and microphone on the Cloud Earbuds. The right-angled connector feels quite durable and only the very tip, where the connector meets the cable, has some flex to it, which helps prevent the cable from ripping off the connector in case it’s pulled. The Cloud Earbuds also come with an in-line control module that is equipped with a single multi-function button as well as a microphone. While it would have been nice to also have volume controls on the module, it isn’t surprising that HyperX omitted them given that the Cloud Earbuds was primarily designed for the Nintendo Switch, which already has physical volume controls on the console itself. The sound signature of the Cloud Earbuds is rather warm and mid-centric, with an emphasis on the high mids that makes vocals really stand out. This makes listening to in-game dialogue and voice chat much easier. Those who like to listen to music with heavy vocals will also appreciate the sound signature of the Cloud Earbuds. The highs and lows of the Cloud Earbuds are still pretty decent though, with the former showing some good clarity and the latter still sounding rather punchy. Gunfire, explosions, footsteps, and more will all still definitely stand out. Although we would’ve liked the highs and lows to be a bit more forward and extended to make them more balanced with the mids. Given their design, the soundstage of the Cloud Earbuds isn’t that wide or deep but the instrument separation is still rather impressive. Users will still be able to tell which direction in-game sounds are coming from. As previously mentioned, sound isolation isn’t that great on the Cloud Earbuds, considering the design of the silicone tips, but isn’t that big of a problem due to how loud they can get. In spite of an impedance of 65 ohms, the Cloud Earbuds are also quite easy to drive. It’s impedance enables you to really crank the volume of your source without worrying about blow outs that much while not really needing amplification for it to get enough power to be loud enough for you to use comfortably. The microphone on the Cloud Earbuds is also pretty impressive for an in-line microphone with loud and clear recording quality with very little distortion that rivals some headset microphones. While the quality isn’t actually good enough for professional recording, it’s great or more than sufficient enough for phone calls, in-game voice chat, or even casual streaming. The HyperX Cloud Earbuds were quite surprising. Despite being the company’s first pair of earphones, the Cloud Earbuds were rather impressive, with its unique but effective design, comfortable fit, excellent build quality, and great sound and mic quality. Its price tag of PHP 2,999 (~$50) also helps it stand out amongst its competitors and with its included accessories offers some great value for its price. Those looking for a pair of quality earphones for their Nintendo Switch, smartphone, or laptop for gaming will definitely enjoy the Cloud Earbuds.